Located in Chambretaud, in the heart of the Vendée region, the Hôtel Les Archers offers comfortable accommodations in a quiet setting, at driving distance from the Puy du Fou. Located near the A87 exit (800 meters), the Hôtel Les Archers puts you at 15 minutes from the Puy du Fou recreation park, at one hour from Nantes and Angers. History lovers will appreciate the Musuem of Victories 15 minutes from the hotel. 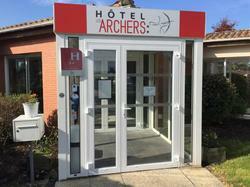 The 44 rooms of the Hôtel Les Archers offer a private bathroom with shower and WC, a television, a telephone and an alarm clock. The hotel also offers two adapted disabled rooms. This room includes a flat-screen TV and a private bathroom and free Wi-Fi.